URBANA, Ill. – Corn growers experienced an epidemic of tar spot in 2018, with the fungal disease occurring in 172 counties across the Midwest. With the potential for another significant outbreak in 2019, a University of Illinois plant pathologist is asking for help from growers. “We need samples of corn and other plants (grasses, ornamentals) infected with tar spot from across the United States and surrounding regions to understand the variability of tar spot populations and develop molecular tools to aid in its study. If you have (or think you have) tar spot, please send them to me,” says Nathan Kleczewski, research assistant professor in the Department of Crop Sciences at U of I. Growers should look for small, black, raised spots (circular or oval) appearing on one or both sides of the leaves, leaf sheaths, and husks. Spots may be found on both healthy (green) and dying (brown) tissue. Kleczewski says the black spots may be surrounded by a tan or brown halo, which is especially obvious on healthy leaves. Leaf samples should be wrapped in newspaper or dry paper towels and shipped in a large envelope, with the following information for each sample: date collected; field zip code or county and state; type of plant; number of plants in the field showing symptoms; approximate percent incidence in the area; collectors name, phone number, and email address. If possible, samples should be shipped early in the week, overnight, and on ice to the Field Crop Pathology Tar Spot Project, U of IL Plant Clinic, S-417 Turner Hall, 1102 S. Goodwin Ave., Urbana IL 61801. In 2018, Kleczewski says, fields in the most severely affected regions reached 100 percent disease incidence and over 50 percent severity on the ear leaf before dent. Yield losses from the affected states were estimated at nearly 185 million bushels. “Assuming a conservative estimate of $3.50 per bushel, this is equivalent to $647 million in lost revenue,” Kleczewski says. 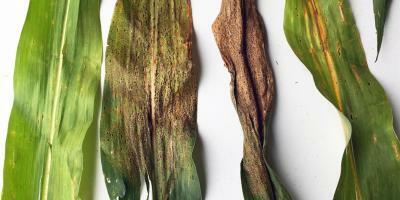 Growers can learn more about the disease in a new corn disease management report from the Crop Protection Network. The free report is available at https://go.illinois.edu/tarspot_resources. The report was compiled by Nathan Kleczewski and Diane Plewa from U of I, as well as researchers from Michigan State University, Iowa State University, Purdue University, and the University of Wisconsin. Please address any questions to Nathan Kleczewski at nathank@illinois.edu or 217-377-4406.